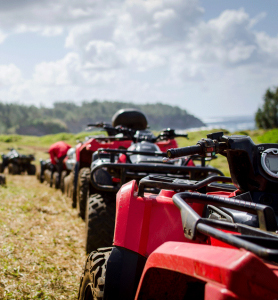 Advanced Plastiforms, Inc works with ATV and recreational vehicle manufacturers to create attractive, stylish accessories and components that can withstand rough terrain with ease. Our plastics provide durability while maintaining a contemporary look while our innovative thermoforming techniques offer faster lead times and lower costs. Thermoforming plastics for recreational vehicles and ATVs allow us to shape large sheets of plastics to offer the intricate detailing, curves and bends the design requires. This technique is often used for the largest components and accessories, often measuring over four feet wide or long. The thermoforming process begins as our engineering team designs, prototypes, and creates a finished tool cast from aluminum based on the exact specifications of our clients. When it’s ready, large sheets of plastic are heated until they are pliable and flexible and are then pressed into the tool to be shaped. In order to ensure the most accurate shape with the appropriate detailing and angles, we utilize three different methods, depending on the specifications of the product. Vacuum forming requires a high-powered vacuum to suction all the air from between the plastic and the tool, creating a tight fit. This method is faster and more cost-effective than other forming methods and works best on large sheets of plastic that don’t require sharp corners and high levels of detail. Pressure forming occurs by using highly pressurized air to press the plastic against the tool, molding it to create sharp corners and clear definition and detailing. Pressure forming applies three times the pressure of vacuum forming and creates results similar to injection molding with a faster lead time and a lower cost. Twin-sheet forming is the most precise method of thermoforming and requires high levels of detail. Two adjacent sheets of plastic are molded around a tool to take their shape and are then fused together. In order for the pieces to join correctly, they must be formed in perfect alignment. Twin sheet forming allows us to create strong, durable pieces with hollow cores, have molded-in attachments, or separate internal components. Using thermoforming to manufacture recreational vehicle parts has two major benefits for our customers – time and cost. ABS, Polyethylene, Acrylic, Styrene, and other plastic materials. In addition to that, we can further customize our products to your exact standards. From painting and silks screening to adding special coatings or textures, we will work with you to create precisely what you need. At Advanced Plastiforms, Inc, we have over 60,000 square feet of space solely dedicated to thermoforming in addition to over 110,000 square feet of tooling storage and assembly space. We are capable of adjusting our workflows as needed regardless of whether we are working on large or small orders or large or small pieces. If you are seeking high-quality, long-lasting plastic products and components ATVs, UTVs, or recreational vehicles, reach out to Advanced Plastiform, Inc. Our team of experts are available to help you create the perfect pieces to add safety, value, and durability to vehicles. We proudly serve seven states, including North Carolina, South Carolina, Pennsylvania, Maryland, Tennessee, Georgia, and Virginia.